My delay in Toronto (en route to Chicago) last Friday turned out to be longer than expected so I had lots of time to draw. 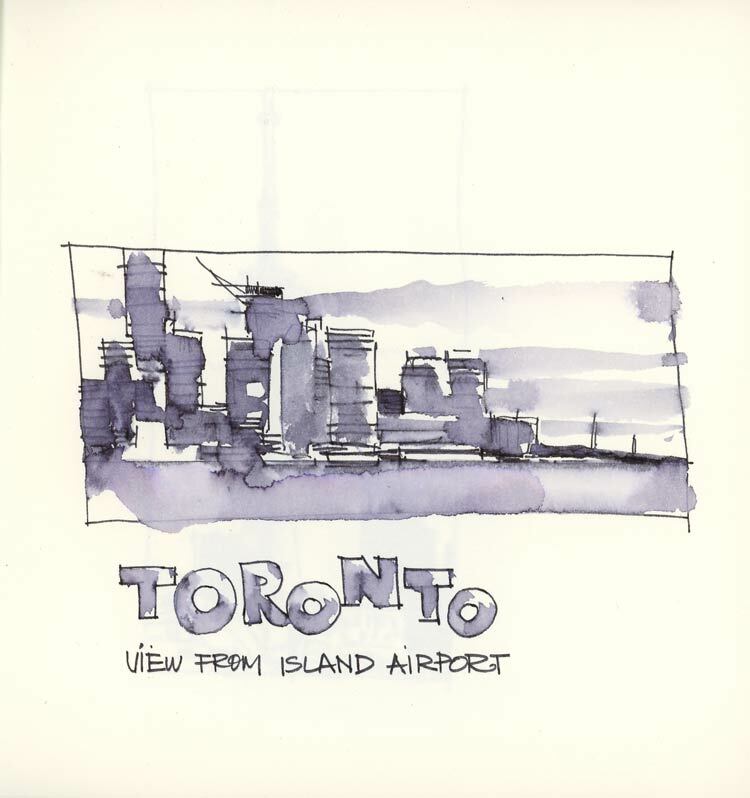 I was travelling very light —carrying only a pencil, some pens, a water brush and some drawing books (it is Inktober, after all) so I made the most of my time by drawing both in Toronto and then at the airport. 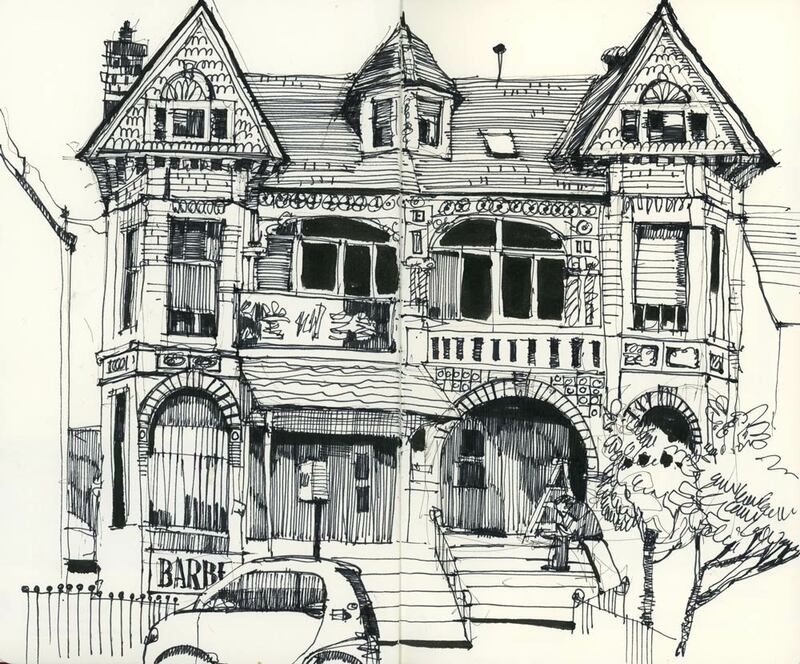 I finished the drawing of the Victorian house across from the museum using only a Sharpie pen and a Pentel brush pen. I did a little thumbnail of the skyline from the island airport, using a Pilot fine liner (water-soluble) and my Koi water brush. When the plane was further delayed, instead of eating the free Porter snacks, I expanded my thumbnail into a more complete drawing. 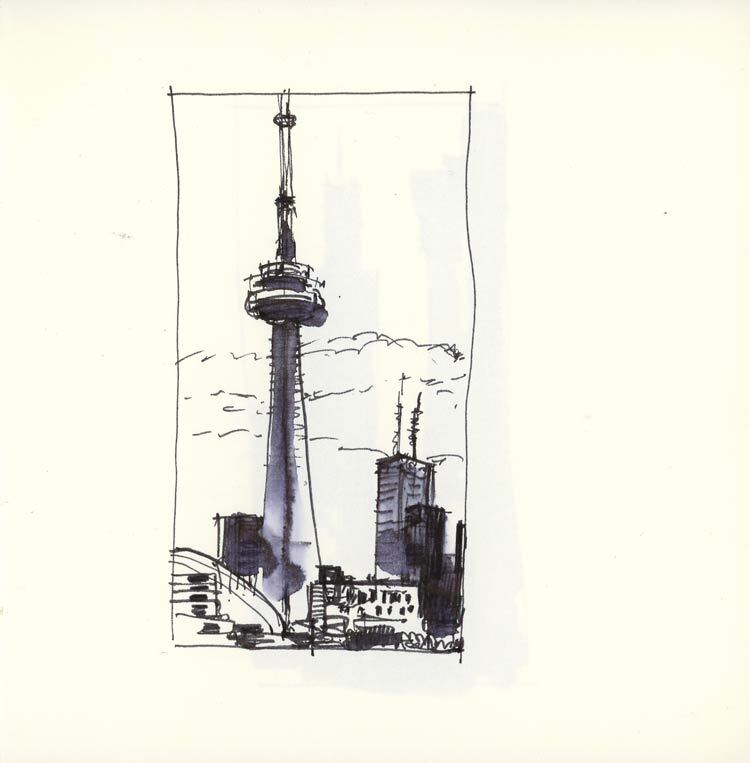 And then did one final thumbnail of the CN tower from the plane just before takeoff. Glad I did all this drawing in Toronto because I didn’t have much time to draw in Chicago. I’ll have to go back there again when I have more time, but tomorrow I’ll post a few of the mini drawings. Thanks Jane. What else can you do but draw when you are stranded like this? That is, if you have a sketchbook with you. You just show your talent in everything you do. Thanks for giving us this view into your drawing ability and how splendidly you use your TIME! I like the line work for shading. I am not a fan of people in pictures. However in this one the man and the ladder seem to belong. And their presence tells a story…whatever the viewer deems that to be. And thankyou for the photo of the house in the previous post. The man and the ladder very much belong in this. He was working away the whole time I was sketching and he took that nice break just at the right moment. I appreciated his timing. Yes, I thought the man was actually there. But if I was drawing that house I probably would have taken the easy way out and not included the man and his ladder. And I think that the man and his ladder look like they ‘belong’ because of the way you have drawn them. The line work is balanced with the house. I can’t explain it except that it caught my imagination and I started wondering about the man; he has a ladder and he is sitting in a particular way. I just thought to myself there’s a story there – one could make up several stories. 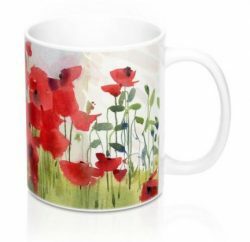 It’s great to view a painting or drawing and have it suggestive of a story. Thoughts of a painting I saw at a small art exhibition, about 3 years ago, have never left me because the painting conveyed such a strong emotion in me. It was a view of a garden with stone steps leading up a slope. About a third of the way up there was a bunch of flowers lying on one of the steps. When I saw this painting I immediately thought, how sad. I spoke with the artist later and told her my immediate reaction and said innocently, ‘there’s a story there’…just using my imagination as a writer. The artist replied that it was the first painting she did after her husband died of a long illness. They were married for 40 years. There was nothing in the painting to suggest sadness or strong emotion. It was painted in an ordinary way; there was nothing in the brushwork or colours to suggest sadness. The flowers weren’t even dishevelled. I think it was the composition. Thankyou for your drawing of the beautiful old house, and the man and his ladder. I hope he had a nice break and he enjoyed working on the old house…and that he was careful each time he climbed the ladder. Marvellous! That’s the great thing with a pen and a piece of paper – you can make a start somewhere in the middle and carry on working outwards till you have to stop. Thanks Anne. I did buy a new format book just for that purpose. Stop and start whenever I had the time. It was perfect for that. Wonderful drawings, Shari! Not only are they a source of inspiration, but they also demonstrate that subjects await no matter where we are. I love the grand old house. Bet it could tell some tales. I wonder how many artists have painted its portrait. Thank you for doing so and sharing it with us! Thanks Louise. And sorry for taking so long to respond to comments. Busy week at school! Talk about making lemonade! Very impressive. As always, these are all lovely Shari, but I especially love the fully-worked skyline drawing -just fabulous! You are such an inspiration. Your drawings are awesome. I was more than pleased – and then some. Somewhat abrupt conclusion because I was cut off unexpectedly while driving in the inner lane on the expressway. 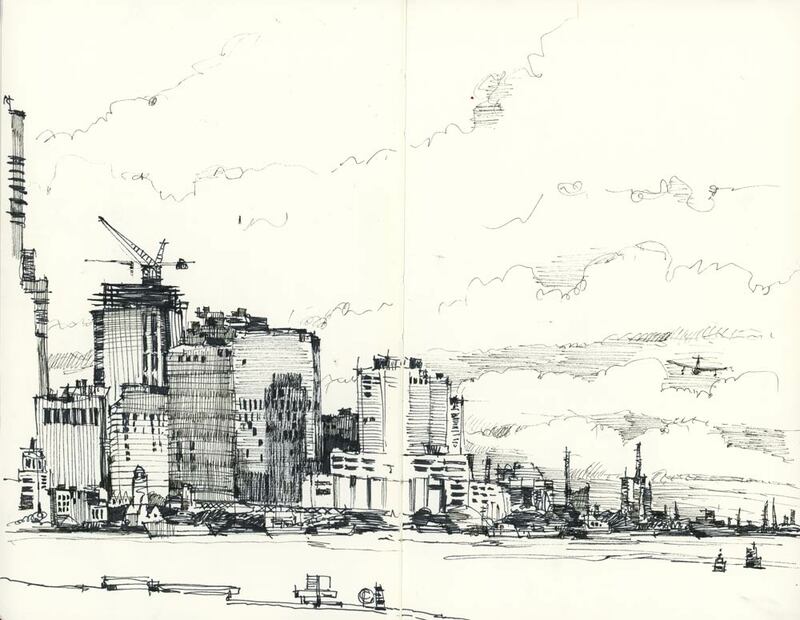 Big cities – great for sketching – tough for driving. It was great to talk to you George. Were you driving during our conversation? Thaks so much Monique. I did eat a few of the free cookies after my drawing was done. Your sketch of the Victorian house is just great!!! Sketching does take some of the frustration out of airport delays…or at least makes them a little easier to take. It certainly makes the time go by more quickly!